In this celebrated "underground classic," also known as "C. L. R. James's most anarchist book," the author of The Black Jacobins, History of Pan-African Revolt and Beyond a Boundary examines the practical process of social revolution in the modern world. Inspired by the October 1956 Hungarian workers' revolution against Stalinist oppression, as well as the U.S. workers' "wild-cat" strikes (against Capital and the union bureaucracies), James and his co-authors looked ahead to the rise of new mass emancipatory movements by African Americans as well as anti-colonialist/anti-imperialist currents in Africa and Asia. Virtually alone among the radical texts of the time, Facing Reality also rejected modern society's mania for "conquering nature," and welcomed women's struggles "for new relations between the sexes." 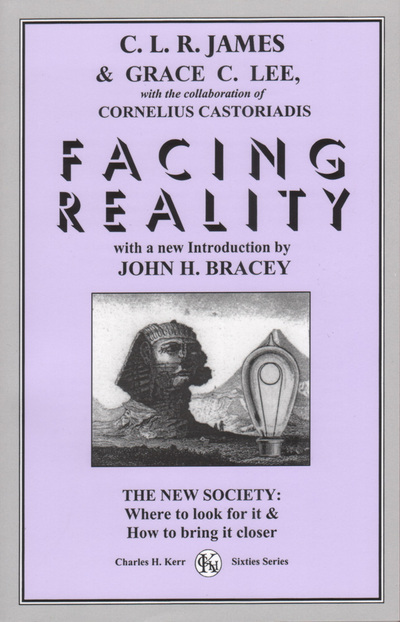 First published in 1958 by a tiny group of James's supporters in Detroit, Facing Reality was popularized by the Chicago Rebel Worker group, Solidarity Bookshop, and other anti-authoritarians all through the 1960s. Later taken up by the SDS journal Radical America in its early IWW/surrealist-oriented period, Facing Reality became -like the works of Herbert Marcuse and E. P. Thompson -one of the most discussed and debated books of revolutionary theory in the late 20th century. This new 21st-century edition includes a new introduction by James's longtime friend, John H. Bracey, situating the book in its 1950s/60s context, and accenting its continued relevance in our time. "Among the most forward-looking books of the 1950s, Facing Reality is not only a merciless critique of the reactionary rationalism that then passed for Marxism, but also a passionate celebration of workingclass creativity and revolutionary internationalism at their inspired best." -Franklin Rosemont, author of Revolution in the Service of the Marvelous (2004).